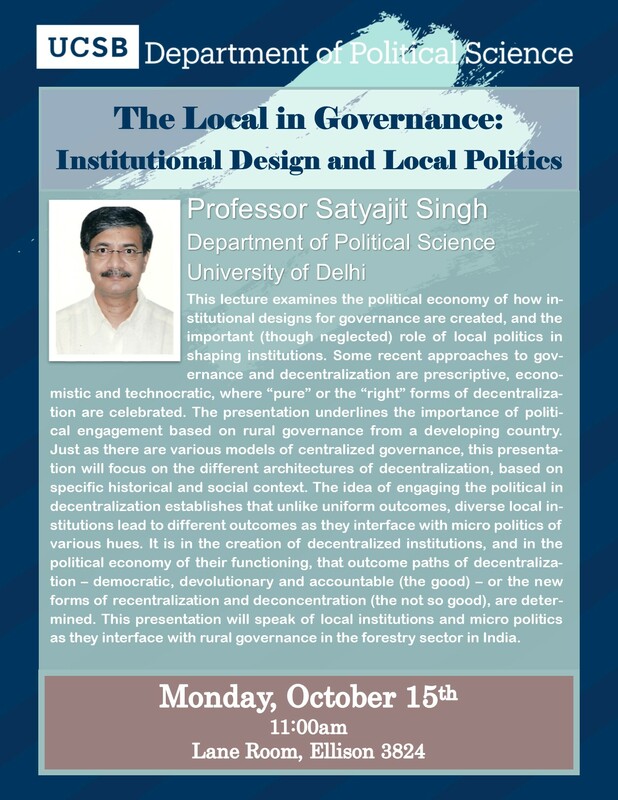 This lecture examines the political economy of how institutional designs for governance are created, and the important (though neglected) role of local politics in shaping institutions. Some recent approaches to governance and decentralization are prescriptive, economistic and technocratic, where “pure” or the “right” forms of decentralization are celebrated. The presentation underlines the importance of political engagement based on rural governance from a developing country. Just as there are various models of centralized governance, this presentation will focus on the different architectures of decentralization, based on specific historical and social context. The idea of engaging the political in decentralization establishes that unlike uniform outcomes, diverse local institutions lead to different outcomes as they interface with micro politics of various hues. It is in the creation of decentralized institutions, and in the political economy of their functioning, that outcome paths of decentralization – democratic, devolutionary and accountable (the good) – or the new forms of recentralization and deconcentration (the not so good), are determined. This presentation will speak of local institutions and micro politics as they interface with rural governance in the forestry sector in India. Satyajit Singh is Professor in the Department of Political Science, University of Delhi. He has been a Founding Dean and Professor at School of Development Studies and School of Human Ecology, at Ambedkar University, Delhi; India Chair at Ryukoku University, Kyoto, Japan; Visiting Fellow at the Institute of Development Studies, Sussex; Leverhulme Fellow for Environment and Development at the University of Sussex; Asia Fellow at the Philippine Institute of Development Studies, Manila; Rural Development Specialist, World Bank and Advisor, UNDP. His research interests are governance, Indian politics, public policy, development and environmental issues. His publications include The Local in Governance: Politics, Decentralization & Environment (OUP); Taming the Waters: The Political Economy of Large Dams in India (OUP); (co-ed) The Dam and the Nation: Displacement and Resettlement in the Narmada Valley (OUP, 1997); (co-ed) Decentralisation: Institutions and Politics in Rural India (OUP). He has also published in Asian Survey and Policy & Society among other places.